Tarzan finds a boy from a crashed plane and raises him with Jane in the jungle. A search party comes looking for the plane. Which adventure would you like to go on? Best Fourth Installment In A Franchise? Mr. Richard Lancing: Wildebeest again. Mrs. Richard Lancing: I think we've seen about a million today. With Tarzan (Johnny Weissmuller) and Jane (Maureen O'Sullivan) nicely settled into their treetop des-res (complete with all mod cons), it was only going to be a matter of time before we heard the pitter patter of little footsteps (other than Cheetah's, of course). However, with the Hays Code in full effect, and our arboreal lovebirds not actually wed, they sure weren't going to be permitted to have a child of their own via the normal method. The writers of the Tarzan series get around this problem by having a child delivered from the sky by 'the great metal stork'—a plane that crashes in the jungle with a baby boy as the only survivor. 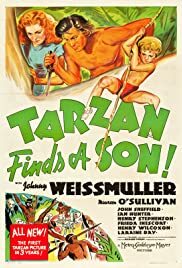 Cheetah finds the wailing bundle of joy and whisks him off to Tarzan and Jane, who decide to adopt the lad, naming him Boy (Tarzan's second choice, after having Elephant rejected by Jane). Five years of blissful family life later, and an expedition turns up at the escarpment searching for the plane and any possible survivors. But Tarzan and Jane have become rather attached to their little tyke, and aren't about to give him up, especially when they discover that two of the visitors only want Boy for his vast inheritance. Aimed at the matinée crowd, this particular instalment features none of the graphic nastiness or raciness that can be found in the first two Tarzan films (the obligatory native killing at the end of the film—via a huge skull-cracking device—is brief and non-explicit); instead, we get mild peril as Boy is attacked by pipe-cleaner tarantulas and a back-projected rhino, comic relief courtesy of Cheetah the chimp, and a lot of fun interplay between Tarzan and his 'son', the best scene being an impressively shot moment of underwater horseplay. 6.5 out of 10, happily rounded up to 7 for the bit where Cheetah turns her lips inside-out to amuse the new arrival (which makes me laugh just thinking about it).